The vineyards near Dijon had been recommend, so we decided to stop for two days. Scott found us a lovely little hotel on Expedia. We didn’t arrive until after dark and were very surprised to find that it had a delightful restuarant downstairs. We had one of the most wonderful meals. The food was excellent, the wine was delicious and the kids played happily on their devices while Scott and I enjoyed a lovely night out. I am not a hug fan of kids with iPads in restaurants, but we have decided that it is necessary sometimes, just so we can have some peace and a full conversation. The kdis are also happy as they get to play games and watch movies, rather than listen to adult conversation. I ordered the cheese platter for dessert and much to my surprise the largest platter of cheese I have EVER seen turned up and I was told I could have 4 large pieces of whatever I wanted. It was like being a kid in a candy shop! How to choose was a bit of a dilemma but you will be pleased to know that I got through it and picked 4 magnificent cheeses! This night came to us at the most perfect time. We were really keen for a nice meal and some time to talk. It gets a bit hard on the road sometimes when you don’t have a break from your kids, so this kind of felt a little bit like that. We didn’t get them to bed until after 10pm but that doesn’t really matter too much anymore as we have no schedule and if they need to sleep in the following morning we have the luxury of letting them do so. Just down the road from our hotel was a cave. We didn’t really know anything about it, I think someone in the hotel told Scott to go, so off we went. We paid for our ticket and waited 15 minutes for the English speaking tour guide to start the tour. It turned out to be the most fabulous little cave. However, we weren’t allowed to take photos inside so you will have to take my word for it! The tour went for about 35 minutes and we learnt all about the history and the guide even let Tom and Milo hold a broken Stalactite which was surprising heavy! We then took a little boat through the cave and got to see where people dived and also lived during hard times. The boys loved it and again really enjoyed the hands-on learning. I took a photo of the promo photo outside so you can see what it looks like inside. Sorry for the glare, I couldn’t seem to get rid of it! This is a photo of me and my boys just outside the cave. Milo kept touching and rattling the doors so I told him off. He has taken to doing yoga poses every time he gets in trouble. It is hilarious and makes it very hard for me as I keep laughing at him! 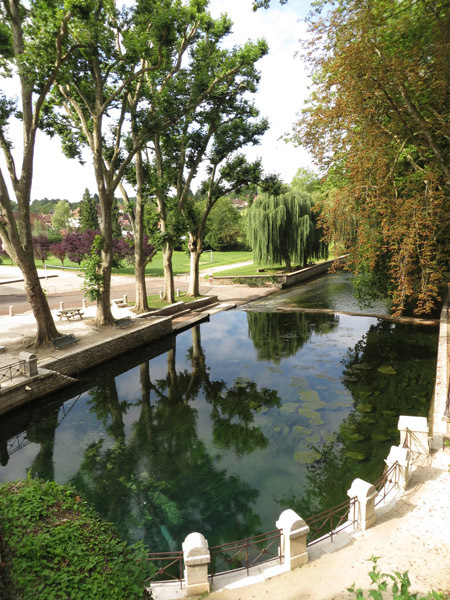 Just outside the cave is a large whirlpool spring where the water originates for a long river that leads through Dijon. It was amazing to see the source of a river like this. I kind of always assumed they were created from runoff on mountains and lakes. The areas around Dijon were just delightful. fields full of sunflowers, little cottages with brightly coloured shutters, churches and wildflowers. It was so nice to also drive in flat fields after all our winding roads in the Alps. We went into town and had a look around. 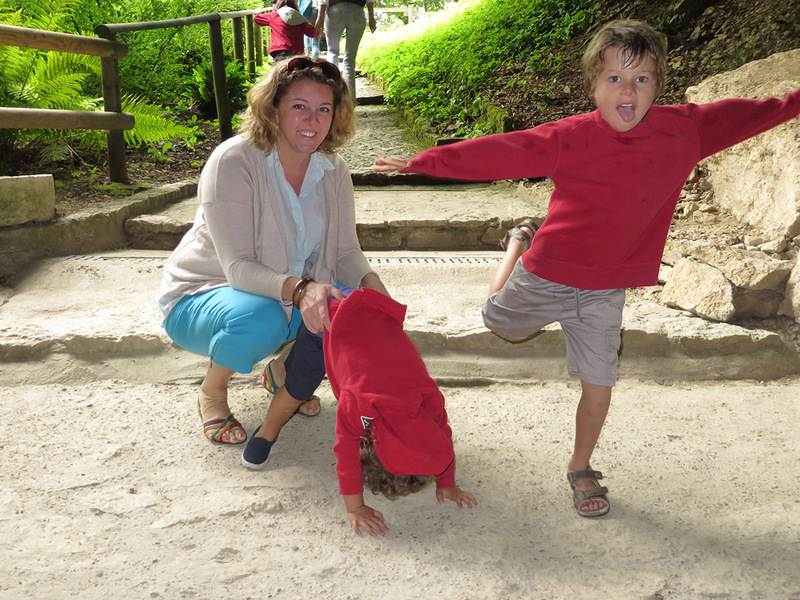 Dijon is a pretty little city with some great parks for kids. I loved all the different buildings and houses. The next day we went out to the Vineyards. 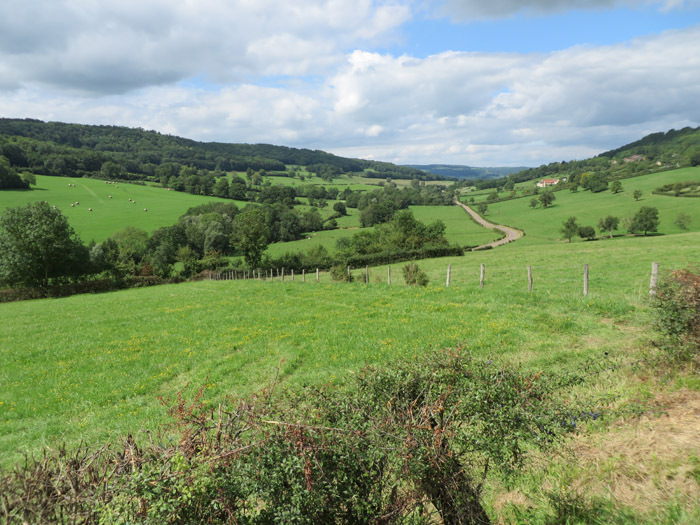 A friend had recommended that we head to an area called Nuit-Saint Georges which was at the end of a lovely long road that headed south out of Dijon. It was filled with gorgeous little vineyards, chateaus and quaint villages. It kind of reminded me of the Swan Valley back in Perth (Western Australia) as it was so close to the city yet you felt like you were in the middle of the country. We stopped for lunch and had a delicious three-course meal. We were in a pretty little main square and like most of France in August, it was completely empty! The kids had a great time playing around with the fountain and cannon’s while we enjoyed our lunch. 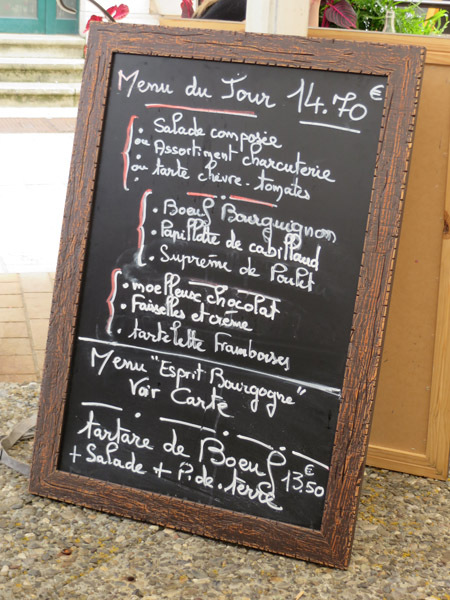 There are menu’s like this all over France. They range from about 10Euro to 30Euro, although most of them are between 15 – 20Euro and on the whole are usually pretty good. This time though, the food was great. I had a goats cheese tart and steamed fish and Scott had the meat platter and Beef Bourguignon. We also ordered dessert but it was so good we inhaled it and I forgot to take photos! The boys had fun and managed to find a fountain and completely saturate themselves. We didn’t mind as they were having a great time and we got t0 have yet another meal in peace! We stopped at the Exploratorium Gallery and wine shop on the way back to Dijon. They had a great display and exhibition showing how wine is made then it eventually lead to wine tasting (it would have been rude not to right?). We bought some lovely wines and headed back to town. Scott and I were a bit food and wined out and really just felt like being somewhere like home. We managed to find a huge shopping centre with loads of restaurants and we were in heaven. Just for a few hours. Sometimes you miss things from home and you can’t have them. A few weeks prior we spent the afternoon in IKEA which was so much fun as it was pouring outside and it was just so familiar. This was the same. We got to wander around the shops and the kids could run ahead. We had a crappy shopping centre meal and bought a few things before we left. Travel recharge was complete! The next day we headed on to our next destination which was Vernon (about an hour North East of Paris) just near Givery (Monet’s gardens) where we are going to housesit for 2 weeks. We had a great drive and stopped at some pretty little towns along the way. Again I was happy to be back in the flat part of France as I get terribly travel sick so it was nice being on straight roads! The whole area was really beautiful. I just love driving through France. It has been so much better than public transport for us as we are able to stop in little villages along the way and enjoy sites that we wouldn’t have been able to reach with a bus or a train. It is much more practical for us as a group of four as Milo can be ‘contained’ in a car seat and we travel on our own schedule. I love being able to stop where we want and to take great photos when we see something we like! I thought we might do more train travel, but the more we drive the more I love it!